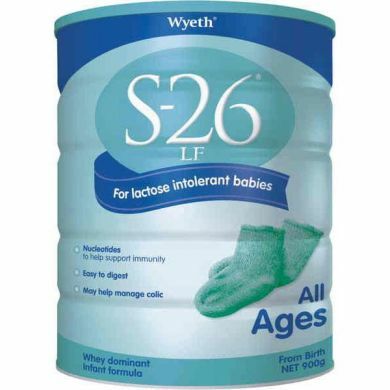 S-26 LF is specially designed for babies requiring a lactose free diet. Lactose intolerance can be triggered by an episode of gastroenteritis and can result in symptoms such as diarrhoea, tummy ache and wind, and usually lasts for several weeks. If you think your baby has developed a lactose intolerance, please consult your healthcare professional who will be able to advise you if you should switch to S-26 LF. Corn syrup solids; vegetable oils [palm, soybean, coconut and oleic (safflower or sunflower)] whey protein concentrate; milk protein isolate; emulsifier (soy lecithin); taurine; nucleotides (cytidine-5'-monophosphate;disodium uridine-5'-monophosphate; adenosine-5'-monophosphate; disodium inosine-5'-monophosphate; disodium guanosine-5'-monophoshate); L-carnitine. Potassium chloride; sodium and potassium phosphates; calcium citrate; potassium bicarbonate; calcium carbonate; calcium and magnesium phosphates; sodium chloride; calcium hydroxide; magnesium carbonate; potassium hydroxide; ferrous, zinc, copper and manganese sulphates; potassium iodide; sodium selenite. Inositol; vitamin C; choline chloride; vitamin E; niacin; calcium pantothenate; vitamin B2; vitamin A; vitamin B1; vitamin B6; natural carotenes; folate; vitamin K; biotin; vitamin D3; vitamin B12.